Enhance your surroundings with lovely moving water with help from the Beckett Fountain and Statuary Pump. Magnetic drive pumps such as this one are efficient and low-energy, designed to run continuously without oil or seals that may fail. This feature eradicates the danger oil leaking into the pond, which can be harmful or fatal to fish and plants. Using less wattage than their direct drive counterparts, magnetic drive pumps can often save enough money in energy use to pay for themselves in just one season. They are also low maintenance with only one moving part, an electromagnetic shaft with impeller. Their durable construction, corrosion resistance, and energy efficiency will make a magnetic drive pump an integral part of your pond system season after season. This Beckett Fountain and Statuary Pump is ideal for small water features and piped statues. 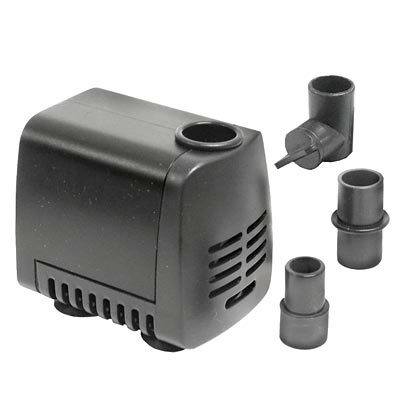 Its low profile, submersible design, and quiet operation make this pump a must for your tabletop fountains, aquariums, statuary, or small water displays. Four suction cups on the base keep the unit secure in your aquarium or fountain, and the item's plastic housing offers corrosion resistance. Adapters for 1/4" and 1/2" tubing are included, and the outlet has a flow adjuster knob for added versatility. Alter the water output to your liking by simply twisting this knob. Add moving water to your favorite container garden or power a small fountain with this Fountain and Statuary Pump. One year limited warranty.